Habitat: Bamboo forests on steep mountain sides from 1600m to 3200m. Distribution: Chiefly in Western Szechwan province of SW China. Length: About 1.5m Weight: up to 120kg. Life Span: Up to 20 years in captivity. Unknown in the wild. 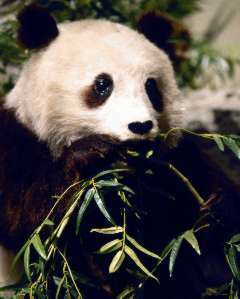 Diet: Mainly bamboo leaves and shoots but also berries, fruit, fungi, grasses, small mammals, birds, eggs and fish. Description: Thick fur: head and body mainly white. Black ears, eye patches, nose, shoulders, arms and legs. Eyes are small and vision is poor. Enlarged bones in wrists allow pandas to grip bamboo stems.